A quick recap of the basics. An external hard drive or SSD (which stands for Solid State Drive) is a device that can be easily plugged into your machine, giving you almost-instant storage space, without having to prise open your computer and make complicated upgrades. Anyone who uses a PC should have an external drive. It’s not only a useful means of data backup and storage, it also allows you to transport files from your desktop or laptop to another device. How much are you backing up? How much “churn” do you have (I.E., 25% of my files will have changed between backups)? What hardware are you backing up? Do you care how long it takes to do a backup? How are you doing your backups. Time Machine, Carbon Copy Cloner, ….? If you back up to a single disk then there is no need for thunderbolt. Some single disks can be driven as fast as possible by even USB2. USB3 is faster than any single disk. Spending money for an SSD to hold backups normally would not make sense. You are paying for speed with an SSD. You get a fast initial backup, but then it just sits there doing nothing just wasting your money. If you have low churn, have done the initial backup, and do incremental backups you are measuring backup time in minutes even on a slow disk. If you have a lot of data then speed does become important as it might take days to do a backup. In this case you might consider backing up to a RAID drive in which case USB3 or lightning would be important. The thunderbolt can back up 7TB of RAID data (low churn) in just a few minutes to a RAID backup drive. HD & ThunderBolt 2 will read/write about 65 MB/s (the bottleneck is the HDD). You can choose the SSD & USB 3.0 since it is over 4 times faster. 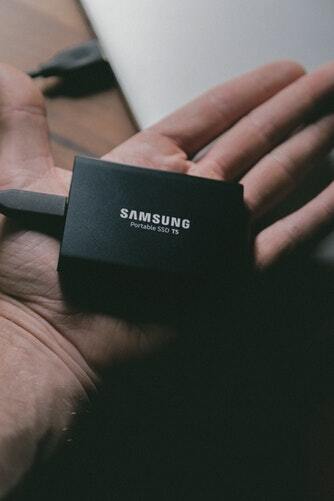 Backing up to SSD may end up being terribly expensive, especially if you follow the guideline of having a backup drive that is 2-3x the size of what you are trying to back up. You can probably use HD & USB 3.0 since it is the most cost effective backup. Pay very little for storage and USB 3.0 isn’t going be the bottleneck anyhow. No sense in paying for an expensive Thunderbolt drive case when the rotational hard drive isn’t going to put the envelope. Buy big cheap hard drive, buy cheap external drive case. The first question when looking for a backup drive is how much data it needs to hold. You could put a lot of effort into figuring this out, but for most people, it’s simple. Buy the largest drive you can reasonably afford, as long as it will hold at least two to three times as much data as you have or anticipate creating in the near future. Say you have a MacBook Pro with a 512 GB SSD. You could get by with a 1 TB backup drive, which would be twice as large as your internal drive. But if a 1 TB drive costs $100 and a 2 TB drive costs $130, it’s probably worth the extra $30 to double the available space.